Chef/Owner Edward Lanzinger of Village Bistro in Tannersville, New York, shares a delicious taste of his charming restaurant in the Catskill Mountains, with his recipe for Venison Medallions with Cognac Cream Sauce. Originally from Salzburg, Austria, Chef Edward Lanzinger feels at home in the Catskill Mountains where nature provides the perfect backdrop for his intimate restaurant. After graduating from a six-year hospitality and tourism program in Austria, he honed his career working in Italy and France before coming to the United States. 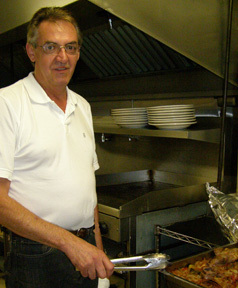 Together with his business partner, Shake Kertoyan, he opened Village Bistro opened in 2006 in Tannersville, New York. 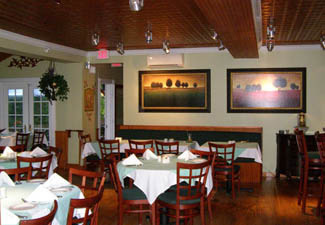 Village Bistro has an international savoir faire where the culinary focus is on "international food" utilizing local and seasonal produce, and local game when available. The menu has enough diversity to appeal to both carnivores as well as vegetarians. Edward and I had had the opportunity to meet Chef Edward Lanzinger and Shake Kertoyan when we had dinner at the restaurant in late August 2011, and found the ambience to be cozy, inviting, bright, and airy, the food delicious and plentiful, and the service welcoming and inviting. 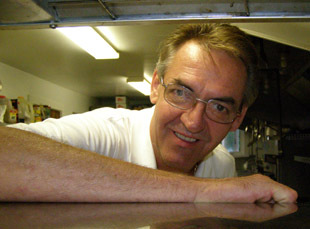 When not working at the restaurant or dreaming up new recipes, you might find Chef Edward Lanzinger out skiing, or perhaps designing and building something or other, as the man is multi-talented and enjoys wearing many hats. Chef Edward Lanzinger graciously shares his recipe for Venison Medallions with Cognac Cream Sauce. Method: At least 8 hours or the day before serving the dish, place the venison medallions in a medium casserole dish and add the wine, rosemary, sage, garlic, and about two-thirds of the chopped shallots, turning the medallions to coat on all sides. Cover with plastic wrap and set aside in the refrigerator to marinate for at least 8 hours or overnight. The next day or when you are ready to proceed with the dish, remove the venison from the marinade, discard marinade, and pat the venison dry with paper towels. Melt the butter in a large sauté pan over medium-high heat, add the venison medallions, and sauté for about 3 minutes on each side until browned and cooked to medium-rare, or to desired doneness. Remove the medallions from the pan, cover loosely with foil, and set aside to keep warm while finishing the dish. Place the sauté pan over medium heat, add the remaining chopped shallots, and sauté until softened and translucent, about 1 minute. Stir in the leeks and mushrooms and sauté until softened, about 2 to 3 more minutes. Add the Cognac to deglaze, stir with a wooden spoon to loosen any browned bits on the bottom of the pan. Stir in the demi-glace, reduce the heat to medium low, and simmer for about 3 minutes. Remove from the heat, stir in the sour ream, and season the sauce with salt and pepper to taste. Presentation: Arrange the venison medallions on a serving platter and spoon the sauce over them. Method: Melt 4 tablespoons of the butter in a large saucepan over medium heat; add the shallots, and sauté until translucent about 2 to 3 minutes. Toss in the mushrooms and tomatoes and sauté until any liquid they release has evaporated. Stir in the tomato paste, then add 1 cup of the wine to deglaze, stir with a wooden spoon to loosen any browned bits on the bottom of the pan. Simmer until almost dry, and then deglaze with 1 more cup of the wine. Simmer until almost dry again. Add the remaining cup of wine, stock, tomato, leeks, and thyme, and bring to a boil. Reduce the heat to low and simmer for about 15 to 20 minutes. In a medium bowl, knead together the flour and remaining butter to form a paste (beurre manié). Whisk this paste into the demi-glace and simmer for about 15-20 minutes, or until the sauce is smooth and velvety. Strain through a fine mesh sieve and cool the demi-glace in an ice bath. Pour into a jar or plastic container and refrigerate for up to 1 week. Method: Preheat the oven to 350°F (177° C). Place the bones in a large roasting pan and roast, turning the bones once, until the meat and bones are well browned, about 1 to 1-1/2 hours. Drain the fat from the roasting pan, add the wine to deglaze, stir with a wooden spoon to loosen any browned bits on the bottom of the pan. Increase the oven temperature to 375° F (191° C). Add the celery, carrots, onion, and garlic to the pan, place back in the oven, and roast for 15 minutes. Remove the pan from the oven, pour in the water, and bring to a boil over medium-high heat. Stir in the tomato paste, leek, bay leaves, parsley, thyme, peppercorns, and browned meat and bone, and return to a boil. Reduce the heat to low and simmer, occasionally removing any foam that rises to the surface, until the stock is reduced to 2 quarts, about 4 hours. Line a large colander or fine mesh strainer with two layers of cheese-cloth, set in a large bowl, and strain the stock. Cool the stock in an ice bath and pour into jars or plastic containers. Refrigerate for up to 1 week. Village Bistro is open for dinner from Thursday until Tuesday from 3:00 pm. Please note that the restaurant is closed on Wednesday. On Thursday, the restaurant offers a special three course Bistro pre-fixe menu. They also have wine dinners throughout the year, and other special interest dinners. 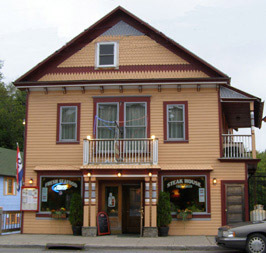 Read about Village Bistro in the Destinations and Restaurants sections. Read other articles on the Catskill Mountains in the Destinations, Restaurants, and Performances sections. © January 2012. Luxury Experience. www.LuxuryExperience.com All rights reserved.